When I hit the 30 week in this pregnancy, I felt myself getting very uncomfortable even doing as little as sitting on the sofa. Rolling over in bed or even getting a full night of undisturbed sleep was a luxury. I never had a pregnancy pillow when I was pregnant with C, probably because he was born at 33 weeks so I never felt so uncomfortable that I needed to buy one. 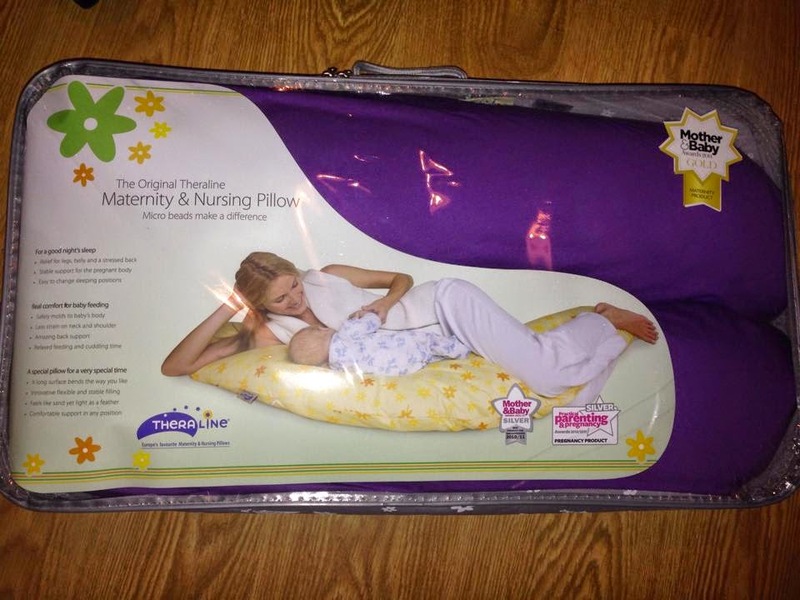 This time round, Theraline sent me one of their Maternity & Nursing Pillows to try out. It arrived folded in a clear, zipped bag. I do love when items are packaged well! When I opened it out, my first thought was that it was huge but that was understandable as it needs to be the full length of your body. Part of me expected a plushy, soft pillow but that's not the case. The pillow is filled with little beads so you can easily mould it into position. When I was in bed, I would tend to keep the part of the pillow in between my knees and calves relatively hard then have it soft at the top so I could rest my head on it. It really helped me to roll over in bed too, it's so easy to just rotate round without having to move it out of the way. I think this is because it is arched rather than just a straight pillow. I even used it on the sofa downstairs but behind my back or around my hips to help me to sit comfortably. There really is no end to how you can shape your pillow thanks to the beads. When E was born, I only breastfed for the first three days but I did have the opportunity to use the pillow as a nursing pillow. I would sit with my back straight against the headboard or back of the sofa, place the pillow along my lap and position E. She seemed comfortable, I was comfortable and she latched easily and without a fuss. Even after the birth, while I was still sore with my stitches, I used the pillow in bed in the same positions as I did when I was pregnant and it really helped. I felt so comfortable. The cover easily zips off to make for easy washing. I would definitely recommend this pillow to all pregnant and breastfeeding mums. It's been really helpful! You can purchase your own Original Theraline Maternity and Nursing Pillow here for £44.95. You can find out more about Theraline on their website, Facebook and Twitter. 1 comment on "Theraline Maternity & Nursing Pillow - Review"
Oh this sounds perfect, just what I'm after!